In the excavator segment, the company has started the process of renewing its entire 23 model JS range, comprising 19 tracked and four wheeled machines from 11 to 46 tonnes. In the 11 to 18 tonne range, comprising seven models, it has replaced the previous Isuzu engines with its own 4.4 litre Dieselmax engine. JCB says this provides up to +23% more torque than the previous power unit, providing faster engine response and up to 10% lower revs, reducing noise and fuel consumption. In the 20 to 24 tonne segment, JCB has retained the low emission Isuzu engine for Europe and the US. However, it is supplying less regulated markets, which it says make up 80% of global demand for this class of machine, with a Tier 2-compliant version of its 4.8 litre Dieselmax engine. The company says this has led to striking fuel economies. For example, using the a 20 tonne class machine in Economy Mode, which is the default mode on start up, leads to a 24% fuel saving. It has calculated that based on a 3500 hour year – typically heavy utilisation in many emerging markets – this translates to € 12000 in annual savings on diesel. As well as re-thinking its engine choices, JCB has made a number of improvements around the machines, and has updated their styling. Most significant from a safety point of view is the integration of roll-over protective structures (ROPS) into the cabs of models weighing 24 tonnes or less. For larger machines, a bolt-on cage can be added, to achieve ROPS compliance and the eye-holes for fitting these cages are a standard feature. Falling object protective structures (FOPS) are also available for the entire JS range. New in the wheeled loader range is the 457, which at 19.3 tonnes is the largest model in JCB’s range, replacing the 456. Repositioning the engine further back on the loader has helped increase the bucket lift capacity to 6.5 tonnes, while the new Tier 4 Interim Cummins engine delivers +16% more power and +18% more torque than on the predecessor. In economy mode the engine is limited to 1800 rpm, which JCB says translates to a 6% fuel saving. JCB has changed to ZF for the 457’s axles and transmissions. A four-speed set-up is standard, but there is also a five-speed option that features a lock-up torque converter for greater traction. The axles can operate with open or limited-slip differentials, and the front axle’s differential can be fully locked. New in JCB’s range of smaller equipment is the 8026 CTS mini excavator. This traditional over-hanging counterweight machine sits in the range alongside zero tail swing models and replaces the 8025. It offers 14% better fuel efficiency than its predecessor along with a 2.8 m dig depth and travel speed of 5 km/h. JCB says that the overhanging counterweight offers greater stability and lift capacity than zero tail swing models in the same 2.7 tonne class, and there is also more space in both the cab and engine compartment. The long dipper stick allows the bucket to work up close to the dozer blade without any difficulty, and the blade itself features a large, powerful hydraulic cylinder. New additions to the compact loader range are the 135 and 155 skid steers, with rated capacities of 612 kg and 705 kg, along with the 150T compact tracked machine, which has a 680 kg capacity. All three ‘small platform’ machines are radial lift machines, making the most suited to bucket work and other applications where high breakout forces are needed. They all feature JCB’s distinctive single-arm boom, which the company says not only improves visibility, which the company says is “Second to none,” but makes life easier and safer for the operator, as access to the cab is via a side door, rather than by climbing over the bucket. JCB also claims a 16% fuel efficiency advantage over competing machines. The cab is pressurised to keep out dust, and it is also a quiet environment, with noise levels of just 76 dB(A). 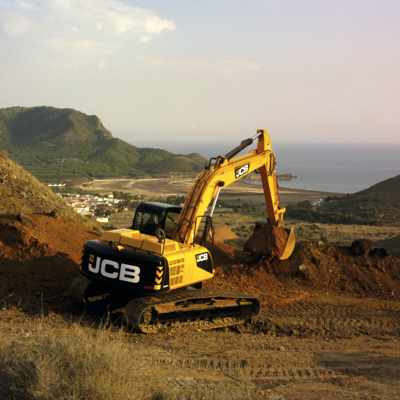 The machines come with JCB’s smooth ride system, and electronic hand throttle and servo controls. JCB has also updated its 1CX compact backhoe loader. An additional 100 mm on the front-end arms now gives a load-over height of 2.59 m, while the extending dipper stick provides 4.7 m of dig reach at the back. A slightly larger cab than on the predecessor model means more leg room for the operator and more space to spin the seat between the two control positions, and it is possible to switch between ISO and SAE control patterns. Additions to JCB’s telehandler range include the 550-80, which offers a 5.1 tonne capacity and 8.l m lift height, making it the highest capacity telehandler the company has ever built. It is designed as a heavy-duty machine for applications such as waste handling, and features a unique z-bar linkage built into the nose of the boom which delivers up to 6.5 tonnes of breakout force. Power for the four-speed power-shift transmissions comes from one of JCB’s own engines, rated at 97 kW. This provides travel speeds of up to 40 km/h and the machine comes with JCB’s smooth ride system as an option. The company has also developed a range of three man baskets for use with its Hi-Viz range of telehandlers. “The demand for an access solution has been growing in recent years,” said group engineering director Mick Mohan. Fitted to a 535-125 JCB telehandler, the 400 kg capacity platforms offer a 14.1 m working height, or 15.6 m when mounted on a 535-140. Compliance with the EN280 standard for man baskets is a key feature of the three new models, and safety features include a single, unique ignition key to operate both the machine and basket, interlocks for the stabilisers and boom, and hose burst protection valves. For example, the telehandler can only be used in platform mode when the stabilisers are down, the hand brake is on, the machine is in neutral and the rear axle stabiliser is on. The three baskets in the range comprise a simple fixed platform, and extendable platform and an extendable, slewing version, which can rotate 90° in either direction from its central position. JCB says the 400 kg load can be distributed in any way across any of the platforms. New from JCB’s range of compaction equipment are the VMT380 and VMT430 tandem rollers, which are available with either 1.3 m or 1.4 m drums, designated by either -130 or -140 on the end of the product number. Depending on this choice, this brings the operating weight of the VMT380 in at either 3.8 tonnes or 3.9 tonnes, and 4.3 tonnes/4.4 tonnes on the 430.